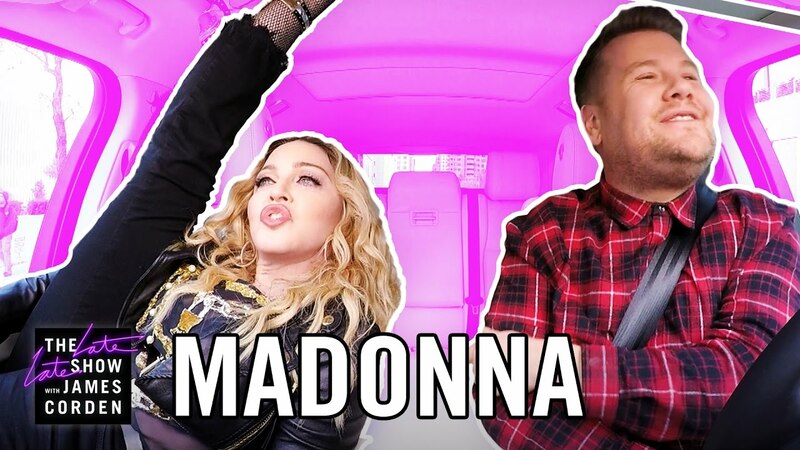 Watch Madonna TWERK With James Corden In NEW Carpool Karaoke! Madonna joins James Corden in the front seat of his car for the latest Carpool Karaoke for The Late Late Show. Please be warned that there is some swearing so it's not for young ears! James Corden's Carpool Karaoke's have become a great source for celebrity gossip, with the stars opening up to The Late Late Show host in the front seat of his car. Now, it's Madonna's turn and she's dropped some juicy tales from her star-studded life including a heavy hint that she once KISSED pop legend, Michael Jackson. Read more: Lady Gaga's Carpool Karaoke With James Corden Is EVERYTHING! Corden kicked off the sneaky line of questioning as he asked his guest: "What was a night out with Michael Jackson, or a night in?" With a cheeky grin, she teased: "So, you want me to kiss and tell, then, don't you?" to which he gasped: "Did you kiss?" Driving through the streets of New York, James, 38, asks Madonna, 58, if he can put on a bit of music to which she replies: "Please, I don't really like riding around in a car unless there's music." Dressed in tight skinny jeans, leather jacket and black fingerless gloves, The Material Girl singer jammed with the host to a number of her hits. Between dishing the dirt, at one point, Madonna even takes off her seatbelt to TWERK to one of her songs. The duo do jam to 'B**** I'm Madonna' so please, you have been warned!